Alcatel can not be described as lacking either a sense of adventure or the desire to shout about their new things from the rooftop. Whether the devices in question make sense is an entirely different kettle of fish. The Alcatel OneTouch Pop Fit is, almost beyond question, an interesting device - designed to be a wearable phone and music device for those that like exercise and music. So far so good. The device comes bundled with an armband and JBL in-ear headphones, and has more peripherals than you could shake a particularly colorful stick at. The issue is that Alcatel appears to have picked two stools, the hot ticket of wearable and the majestic smartphone market, and wedged a device between. At floor level. The phone weighs in at 78g, but it's not by any stretch of the imagination diminutive enough to be an ideal solution for the wearable tech fan, nor powerful enough to appeal to someone looking for a cheap phone. Actually, without an announced price point it's difficult to really understand what market Alcatel's OneTouch Pop Fit is aimed at. Given that the various sport options it will go up against include the Huawei Talkband, Neptune Pine, Nike Fuelband, Fitbit Force, Samsung's Gear 2 it would be a cheap jibe to suggest that the chances of it Fitting anywhere are small, regardless of the price. The screen - a 2.9 inch QVGA display - serves up a nice reminder of just how big pixels can be when you are looking to cut costs, and the touch input is mediocre. The device boasts a dual-core 1GHz CPU to keep your music flowing and your blood pumping and you can get onboard storage of either 16 or 32GB - enough space to get you through a marathon. There's also a RunKeeper app to track your movements and store the GPS data that the Fit gathers. 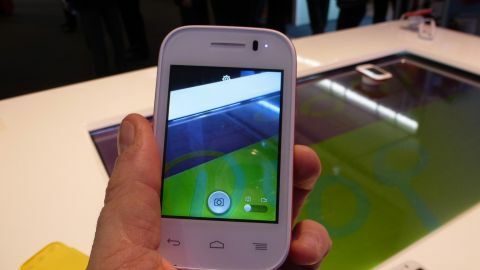 The 2MP camera is an odd addition, as is an NFC version. Presumably midway through your run you can rip off your armband and take a blurry shot of a passing fox and then pop into the NFC enabled gym of the future. It also comes in many colors. Many, many colors. Hurrah. Assuming the price is sub $100, maybe Alcatel is hoping this will be the kind of device you don't mind taking out in difficult circumstances. But it seems to fall short of being a proper wearable device in terms of its dimensions, and it certainly falls short of being a particularly nice phone to use. If I'm honest, I just don't really get it.